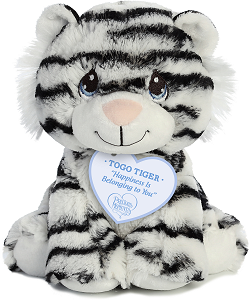 With a sweet face to melt your heart, Precious Moments Togo White Tiger also has a very special inspirational tag bearing his name and an encouraging message that is close to his heart - "Happiness Is Belonging to You." This adorable plush white tiger has a huggable body of soft black-striped white fur, white feet and tummy, pale pink nose, and an endearing smile set below beautifully embroidered blue tear-drop eyes. 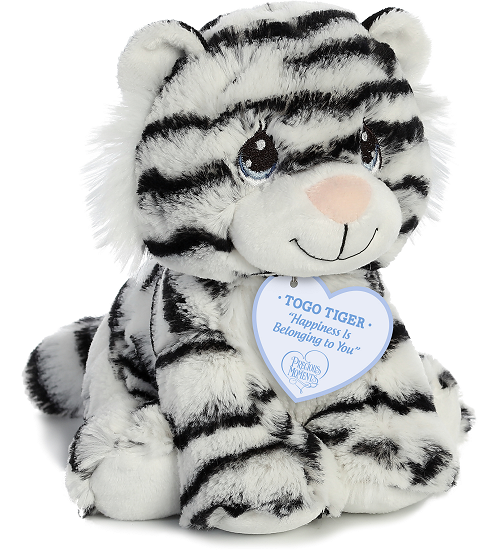 This Precious Moments Togo Tiger is a stuffed animal white tiger that will Share the Gift of Love for years to come. Harley is an adorable plush hippo with soft lavender fur and an inspirational message of Hip Hippo Ray. Ming Ming is an adorable plush panda with soft black and white fur and an inspirational message of Too Cute to Handle. Hamilton is an adorable plush lion with soft tan fur and an inspirational message of You're Adorable. Kiki is an adorable plush monkey with soft light brown fur and an inspirational message of I'm Bananas for You. 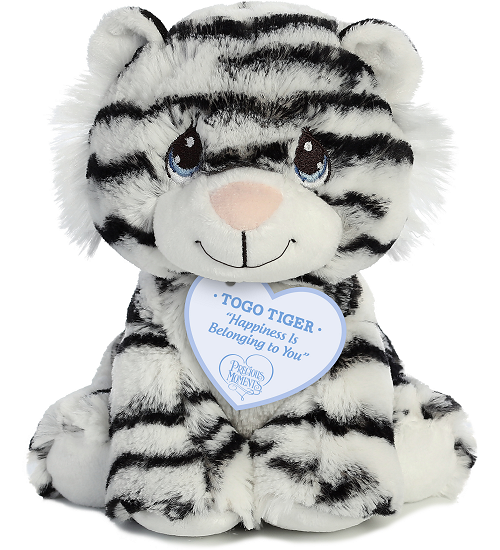 This adorable Huggers plush white tiger has soft black-striped white fur and plush-covered snap bracelet arms.